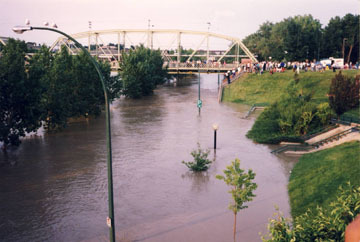 River Road is flooded in this photo from the 1995 flood in Medicine Hat. City officials are warning citizens flood levels may reach the same level in the next couple of days. Medicine Hat is home to Grasslands Church, a Grace Brethren congregation. The city of Medicine Hat, Alberta, home of one of the newest congregations in the Fellowship of Grace Brethren Churches, Grasslands Church, is preparing for possible flooding that some have said could rival a serious flood in 1995. He adds that Grasslands Church has a couple of families living in areas that could be effected. Pray for the city and the safety of the people there during this time. People in the city are in somewhat of a “panic” mode with the grocery stores being swarmed and gas station line-ups. I’m hopeful that the spirit of urgency doesn’t result in anything dumb happening. Below is some additional coverage of the situation.